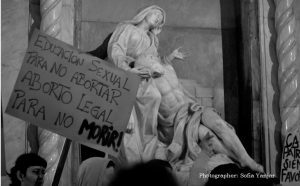 The past year has seen surprising changes towards legalization of abortion in countries known for their strict abortion laws. Chile liberalized their ‘under-no-circumstances’ stance in August 2017; Ireland went to the polls on Friday 25 May to vote in a referendum that returned a large majority in favour of end the country’s ban on abortion; and Argentina has seen an amazing public deliberation – in and out of Congress – on a bill to allow abortion in the first 14 weeks, resulting in the lower house passing the bill in June 2018. Why do we see these moves, and why now? In this roundtable we meet some of the key ‘movers’ behind these reforms. We will also hear why the United States is moving in the other direction, a development that is expected to escalate with the appointment of a new Supreme Court justice. This entry was posted in Bergen Exchanges 2018, Gender justice, Gender, Sexuality & the Law, Sexual & reproductive rights on August 7, 2018 by AnnaG.